The Chinese firm LeEco has launched an earphone and a headphone with USB Type-C ports. While the LeEco CDLA earphones are available to buy in China from the company website, there is no word on the price and availability of the CDLA Noise-cancelling headphones. 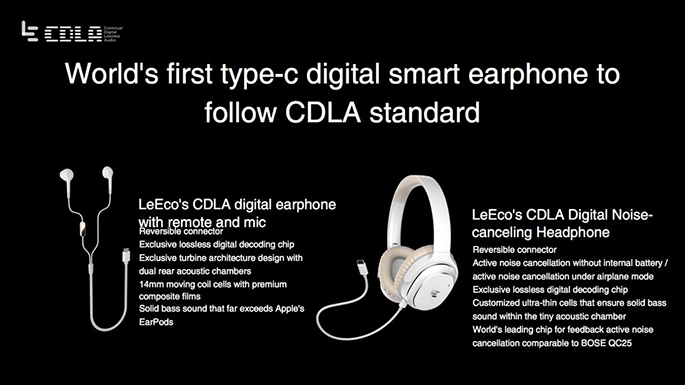 The LeEco CDLA earphones, besides featuring the reversible USB Type-C connector, include a digital decoding chip to deliver audio quality in 24 bit/ 96 kHz. They also have a turbine architecture design with dual rear acoustic chambers; built-in Knowles MEMS microphone for taking calls, and 14mm moving coil cells with premium composite films. The earphones are priced at CNY 149 (roughly Rs. 1520). For the CDLA Noise-cancelling headphones, LeEco claims that they feature active noise cancellation that is also active in airplane mode, and works without an internal battery. They sport a lossless digital decoding chip for 24 bit/ 96 kHz audio output; customised ultra-thin cells for enhanced bass levels within the acoustic chamber, and an audio chip for feedback-based active noise cancellation. LeEco at the same event launched three smartphones namely the Le 2, Le Max 2 and Le 2 Pro. The company says these three smartphones are the world’s first to forgo a typical 3.5mm headphone jack and instead feature USB Type-C audio connector. The metal-clad handsets unveiled in an event in Beijing run Android 6.0 Marshmallow out-of-the-box with Emotion UI 5.6.01 skin on top. They will also be compatible with the VR headset the company introduced at the same event, set to launch in China in May.